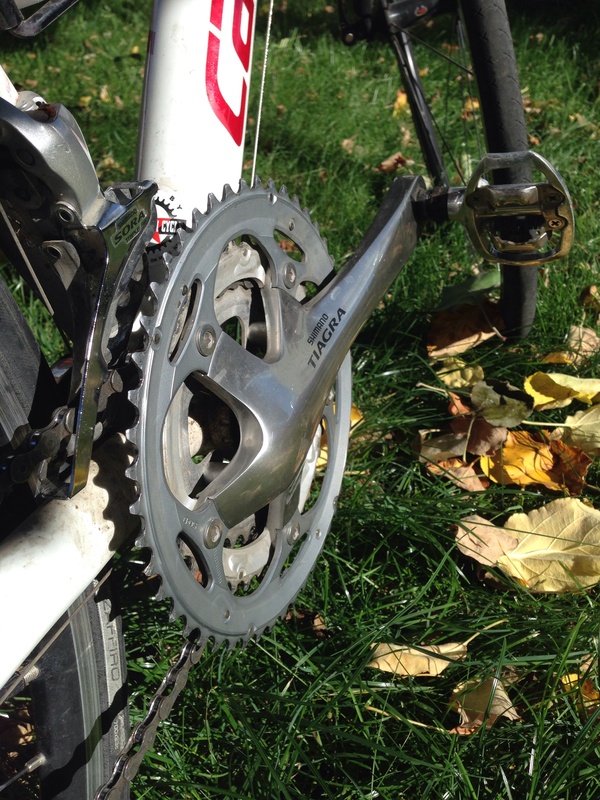 Thursday marked my first Fall ride with Cycling Mamas. Twice a week I get to drop off the monkeys and ride my bike through the river valley with an amazing group of women. As my hands froze and the sun shone in my eyes, I took in the beginnings of fall and was reminded of last spring and my first ever ride with these ladies. I’m a real Newbie when it comes to group riding. One of the things that makes this group so lovely is so many women in so many different times of life all coming together to support, encourage and socialize with one another while being active. But, used to being a lone rider (or runner or swimmer) there are many mornings after very little sleep that this introvert does not feel much like socializing or being supportive. My first Cycling Mamas ride was one of these and it’s how I found myself riding alone- the fastest riders a distance ahead and the fast-but-not-the-fastest riders a distance behind. It was lovely and I felt good and comfortable, riding at my own pace with my own thoughts, until there was a bend in the path. I lost sight of the leaders. It would have been fine except that on the other side of the bend was a fork- and being new to the group I wasn’t sure if I should take the left or the right. I chose right and by the time I realized it was wrong and cut to where I knew they were headed I was far enough behind that I’d lost the slower group too. My first group ride had turned solo. It was an area I often ride and after reassuring myself in my head and then out loud that it wasn’t stupidity just inexperience, not flakiness, just unfamiliarity, not something to classify as a predictable socially awkward outcome for me, I continued on and had a great ride. And I was glad to be alone because I had a cold. A really bad cold. A cold that just went on and on and on. I’d already stopped several times to blow my nose but it wasn’t long before I ran out of Kleenex and patience and so like the well seasoned cyclist I like to think I am, I plugged one nostril, looked over my shoulder and blew. But I had a cold. A head cold. A whole head full of mucous and goo and when I blew, that boogly goo didn’t fly into the the trees liked I’d planned. Instead it went on and on and on then hung in the air for a second before plastering itself all over my cheek, neck, shoulder and arm. I tried to wipe it off best I could but I’d already used all my Kleenex. Tired and coughing I made my way back to the church where we meet. It was there, riding in alone that I saw David Dorward, our MLA at the time. It was just before the election and he was there in his suit. We chatted for a bit and then he politely asked what was on my shoulder. I looked down, then up and red faced, sheepishly replied that it was, in fact, snot. For all the things in my life that I blame on my own inadequacies- not staying on top of the mountains of laundry, being late so often, increasingly lack of conversational skills, low grade aphasia, poop on my shirt- things that are actually caused by two many babies wanting my attention- it’s nice, once in a while, although it has nothing to do with babies, to let them take the blame. Bananas. We have a fruit fly problem at our house and still I’m a sucker for sweet, over ripe 50% off over ripe bananas. 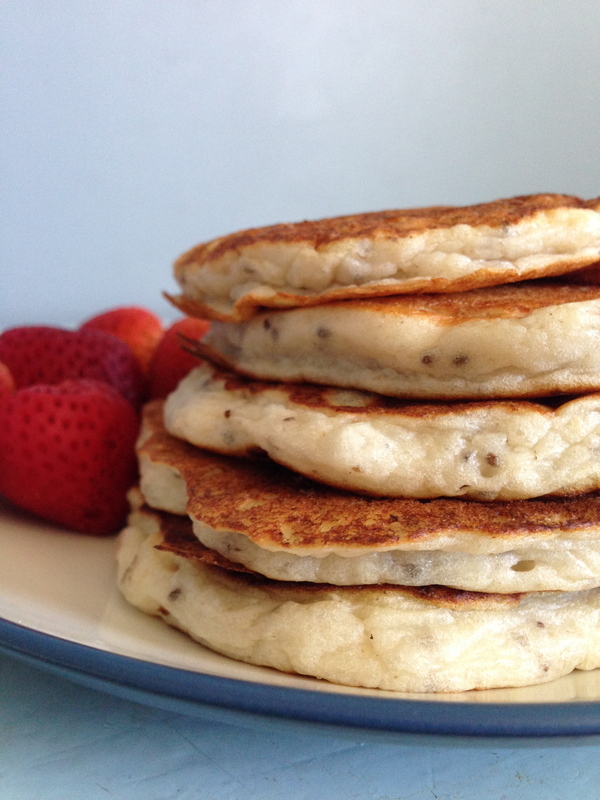 These pancakes make great use of them, have the added nutrition of chia seeds and don’t need any added sugar. The babies will eat the left over for days. Combine flour, chia, baking powder and salt. In a separate bowl, mix together egg, milk, butter and bananas. Stir flour mixture into banana mixture; don’t worry if there are a few banana lumps. Heat a lightly oiled frying pan over medium high heat. Pour or scoop about a 1/4 cup of the batter onto the griddle, Cook until pancakes are golden brown on both sides; serve hot. I like to simply add caramel yogurt to these.